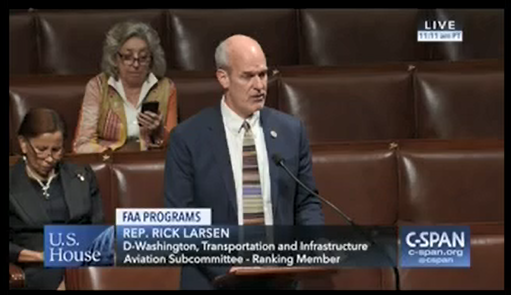 You can listen to Larsen’s remarks on the House Floor in support of the five-year FAA reauthorization bill here. Aerospace manufacturing: More than 1,400 aerospace companies call Washington state home. The FAA reauthorization will streamline the FAA’s certification processes for aircraft and other aviation and aerospace products, allowing U.S. manufacturers to have newer and safer products to market faster. Supports the next generation aerospace workforce: According to the Boston Consulting Group, there are 25,000 unfilled STEM jobs in Washington state. The FAA reauthorization recognizes the importance of recruiting, training and developing the next generation of aviation workers. The bill includes the development of a task force at the FAA to develop recommendations on encouraging high school students to enroll in aviation manufacturing, maintenance and engineering apprenticeships, and creates two new grant programs to support pilot education and the recruitment of aviation maintenance workers. Increases safety for traveling public and employees: The bill mandates ten hours of rest for flight attendants, a requirement that has not been updated in two decades. The bill also includes language to address sexual harassment of employees, passengers and crew through open reporting and accountability. Supports innovation in aviation: Safety is, and must be, Congress’ number-one priority when it comes to the use of unmanned aircraft systems. The bill lays the groundwork for the safe and swift integration of drones into the national airspace and advanced drone operations, like package delivery. For years, Larsen has led the charge for long-term, comprehensive FAA reauthorization. In the 115th Congress, he has been at the helm of a series hearings exploring the needs of aviation stakeholders, including: growth in the drone and commercial space industry, modernizing the national airspace as part of the FAA’s NextGen program, alleviating congestion and improving user experience at Sea-Tac and reforming aircraft certification to help U.S. manufactures better compete globally.